The best part of traveling with your family is creating new memories together. Venice is such a magical city to make this come true. However, while you are traveling there you should not forget that the touristic part of Venice is an island. What does this mean? It means that an island can offer a limited place for accommodation. Within the places available, you have to look for the best family stay in Venice. Fortunately, the options are ready for you. Here are the most family friendly hotels in Venice to make sure you spend the best time with your families. We always say that family time is the best one. At the same time, family trips can turn into an unpleasant issue if not carefully planned. Especially if you have small children, you have to look and go for the best option for their comfort and joy. That’s why a family trip requires more work than you imagine. The most important part of this planning is to find the best accommodation for your family. In this way, you can be sure that you will rest well with your family and spend a nice time there – as a first step. In the case of Venice, we have narrowed down the options for your family trip and listed most family friendly hotels in Venice. These hotels will make difference both for you and your children during your stay. Located in Castello area, Hotel Bucintoro offers you a perfect view along with your rooms. For families, they have connecting rooms and also double or triple size rooms. Breakfast is served as an open buffet and it’s very rich. The hotel is situated away from the regular tourist crowd as well which will give you a chance to enjoy the peaceful atmosphere during your stay – a rare find in Venice. The transportation from and to the airport also pretty convenient as the ferry stop is just a few minutes away! Hilton Molino is not located on the main island of Venice but in Guidecca which takes a small ferry ride from the main island. The advantage of staying in Guidecca is that you will enjoy the less crowded streets and more of serenity here. The hotel has family suites available for kids or teenagers staying with two adults. You can enjoy the rooftop bar – which also has a fantastic view including the pool with your family playing family games as well. They also offer non-alcoholic beverages, so while you sip on some Bellini the kids can enjoy their beverages. Another great find in Castello area is Hotel Palazzo Vitturi. It’s still very close to central locations such as St. Marco Square, however, the neighborhood is still quiet and less touristy than you expect. They have family rooms which are known to be large and can accommodate a family of four at least. There are a lot of restaurants and ice cream shops nearby as well. Location is great for public transportation too. Castello is where all the beautiful hidden places are. Hotel Bizansio is also one of those. The hotel is centrally located but still in a very calm area which is ideal for a family stay. The rooms they offer are quite spacious and family suites comprise of two adjoining rooms. If you would like, you can also opt for a family room with a small kitchenette and a washer. The service is very professional and helpful. Plus, it’s very close to Rialto Bridge and St. Marco Square by walking. The building which is known as Pensione Accademia now once used to be the Russian Embassy mansion between World War I and II. This historical building now accommodates many people from all around the world. The family rooms are also available here like others. The best part for families is the mansion is very spacious and they have a garden courtyard at the back of the hotel which you can have your breakfast in the morning. Right next to Grand Canale, the view is amazing from the hotel rooms, you will adore every little detail at this magical mansion. If you want to be closer to the main attractions but still look for a private place to enjoy your stay, Splendid Venice will save you. 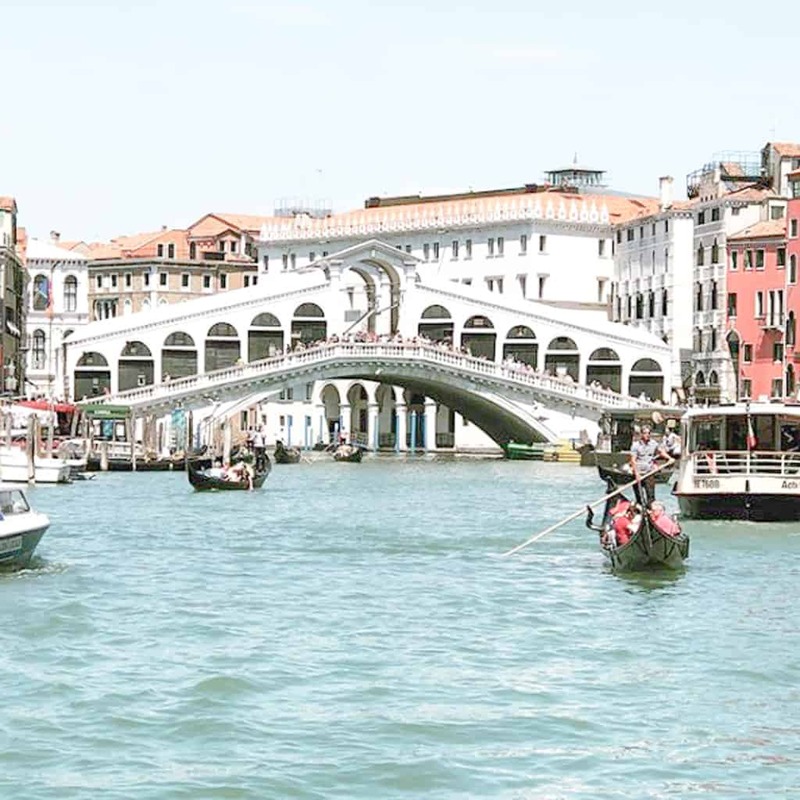 It’s located in middle way from Rialto Bridge to St. Marco Square. If you are coming here by water taxi, the hotel has its private dock so you can directly get off at the hotel – as the hotel is right next to the canal. The family rooms also can be interconnecting upon request. The breakfast buffet offers abundant dishes along with gourmet coffees made to order. A nice and pleasant boutique hotel to fulfill your Venice dreams. Hotel Al Ponte Mocenigo is not only known to be one of the best family hotels in Venice but maybe the best hotel in Venice. It looks like it’s impossible to leave here without being happy about this place. Service is impeccable as you can imagine. The rooms are designed and decorated very sophisticated. You can have your breakfast in the small courtyard of the hotel. The location is also very advantageous as well – close to ferry stops. The hotel has family rooms seeing the canal as well. If you want to spend your trip to Venice in a more home-like environment with your family, Residence Corte Grimani offers holiday apartments. The apartments can accommodate up to six people. In the residence, your apartment would include a dining area and living room along with a spacious bathroom – which has both a washing machine and a dryer. It’s a perfect place for crowded families. Very close to main locations as well but still a very peaceful place– you and your family will still like home here. Hotel Flora is another hidden gem in the middle of the main island. Elegantly decorated, welcoming staff and fantastic atmosphere are the few details you would experience here. They have a small but very cozy backyard with a small water fountain in the middle. Here you can enjoy your meals with your family as well. You can walk everywhere from the hotel – thanks to its perfect location.